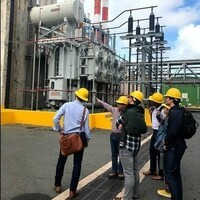 In November 2018, staff from the Revers Center for Energy and 10 of the Center’s 12 MBA Fellows traveled to Puerto Rico for a five-day trek to study the factors that contributed to the prolonged power outage, why it took so long for the island to rebuild its electrical grid, and what policies, regulations and commercial investment might support a more resilient and clean energy system over the long term. April Salas, Executive Director of the Revers Center for Energy, supported the team in organizing meetings with various stakeholders on the island including the Governor’s Recovery Office director for infrastructure, the Puerto Rico Electric Power Authority, independent power producers such as AES and EcoElectrica, SunRun, and a member of Rocky Mountain Institute’s Islands and Electricity Puerto Rico microgrid team, among others. Kevin, Mathew, and Vengatesh will share their experience, sights and conclusions from their visit.